I’ve had a few folks ask me about my plans and ideas for Apple Watch. While I don’t try to be too coy about what I’m working on I’ve definitely kept some of my ideas close to the vest. I’m well aware that ideas, in general, are useless on their own. But that doesn’t mean that being promiscuous with your ideas is still always a good choice. Trying to formularize this I came up with the following structure for ideas and where sharing them is likely a good and poor choice. 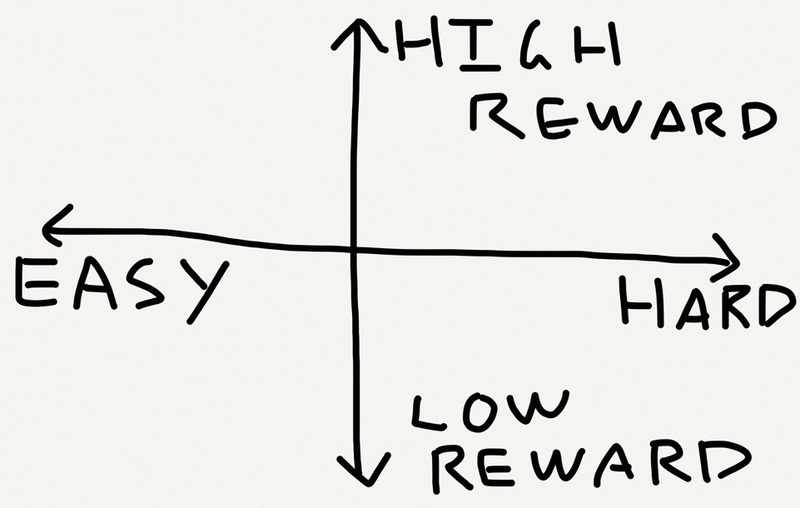 On the one axis is the ease of implementing/realizing the idea. On the other is the expected return on a successful implementation of that idea. Easy, High Reward: If you actually have one of these (you likely don’t) keep it quiet and run with it as fast as you can. Likely hyper competitive. Simultaneous invention everywhere. Easy, Low Reward: Confections that are likely flash in the pan (if they flash at all). Hard, Low Reward: Time sinks, labors of love. Most ‘I have a great idea for an app’ pitches. XKCD on easy vs hard problems. Hard, High Reward: Real businesses are built here.